1. 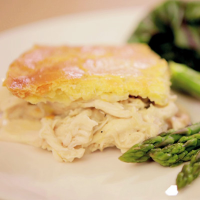 To make the shortcrust pastry, sift the white flour blend into the bowl of a food processor. Add the xanthan gum and salt and blend to mix well. Add the dairy-free margarine and blend until the mixture resembles breadcrumbs. Add the egg and blend for 20–30 seconds until the mixture comes together to form a sticky dough. Shape the pastry into a ball, wrap it in cling film and chill in the fridge for 30 minutes. 2. To make the sauce, melt the dairy-free margarine in a heavy-based saucepan over a low heat. Stir in the white flour blend, then add the white wine and the stock and stir in. Add the dairy-free cream, turn the heat up to medium and bring to the boil, stirring continuously as it thickens. If the sauce gets lumpy, beat with a whisk until smooth. Turn the heat down to low and simmer very gently for 10 minutes, stirring frequently to prevent the sauce from sticking to the pan. Season with salt and pepper. 3. Preheat the oven to 200°C/gas 6 (180°C/gas 4 fan). Heat the oil in a frying pan over a medium heat. Add the onion and cook, stirring occasionally, for 2–3 minutes until just starting to turn golden, then add the garlic and cook for another minute. 4. Transfer the onion and garlic to the white wine sauce and stir in. Add the chicken and tarragon and stir into the mixture, then season with salt and pepper. Transfer the mixture to one large pie dish or two medium-sized dishes, or to a 1.5 litre ovenproof casserole dish. 5. Put the pastry on a piece of baking parchment and roll it out to a circle about 3mm thick, and 3cm wider than the dish. Be careful as the pastry will still be slightly sticky – if it’s too sticky, put another piece of baking parchment on top of the pastry and roll over the top of it. Peel the top piece of parchment off the pastry and turn the bottom piece of parchment over to drop the pastry onto the dish. Press the edges of the dough down gently to crimp, then neaten the edge using a sharp knife. Using a pastry brush, brush the pastry with the beaten egg. Cut a small cross in the centre with a sharp knife to let the steam escape. 6. Bake for about 45 minutes until the pastry is a rich, golden brown.